Serving Pink Lemonade: Serving Pink Lemonade's Big Quiet Book Giveaway! Serving Pink Lemonade's Big Quiet Book Giveaway! Thank you to everyone who joined me in sharing my quiet book games over the last few months. As promised, today starts Serving Pink Lemonade's Big Quiet Book Giveaway! 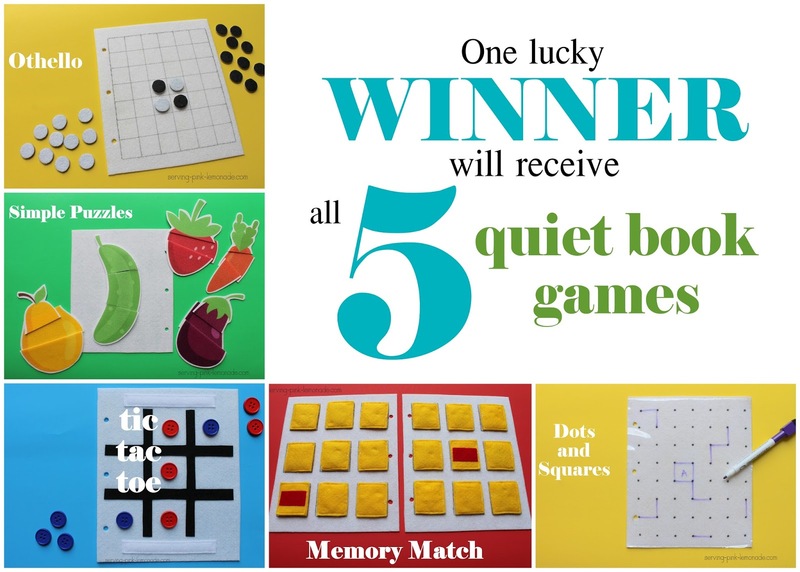 One lucky winner will receive all five quiet book games! Five quiet book pages already made for you! These pages practically make up a quiet book all by themselves. Keep them for your own kids or give them away as a "homemade" gift (you don't have to tell them you didn't make them :) These pages come separately--meaning the pages will not be sewn together in a book. This way you can arrange them into your own quiet book however you'd like or divide the pages into separate quiet books and add your own pages to them. Sweet! 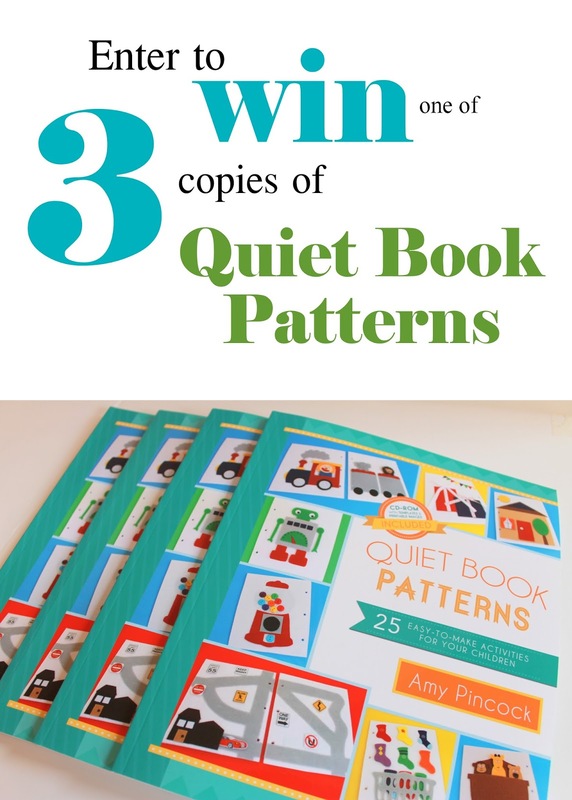 Three more lucky winners will receive a copy of my book Quiet book Patterns! Quiet Book Patterns includes 25 easy-to-make activities for your children. This book is full of original quiet book ideas that are sure to keep your child's brain active and their hands happy! Each page is formulated to help your child to learn through play--because that is how young children learn best! The pages include fun ways for children to use their imagination, develop storytelling and problem solving skills, express creativity, improve hand-eye coordination and fine motor skills, as well as learn about sorting, color, and number recognition. All of this and more through playing and having fun! Each book also contains a CD so you can easily print out the templates to make your book. With simple instructions and templates in hand, I don't think there's an easier way to make a quiet book! What are you waiting for? Enter through rafflecopter below and be sure to tell your friends to stop by and enter too! I live in Texas and we don't really have spring, but I love that it's time for smoothies and milkshakes all the time! I love spending time outside, the flowers, and wearing less clothes! Getting outside with the kiddos, wearing flip flops, and all of the new blooms (as long as I've taken my allergy meds first!). 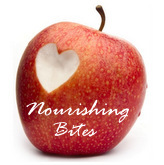 What a great way to help children learn! Your quiet book patterns were how I made my first quiet book! I would love to have more templates, patterns, and even all finished pages!! I love quietbooks! I really want to make one for my youngest although I fear he is getting too old. Thankfully I still have nieces and nephews. My favorite thing about spring is seeing the flowering bulbs & trees and watching our kids explore and enjoy them too! I love seeing all of the buds starting to bloom on the trees! I also love letting my boys run around barefoot in the grass. Spring is so fresh and the sunshine feels so good! Love quitebooks! I just want someone to put them together for me. The flowers! Love the bright, happy colors! I like seeing the bare, dead looking trees burst back into life with blossom! Cool giveaway! I love your quite book idea. And my favorite thing about spring is being warm again and not having to wear socks! I love how the bluebonnets bloom here in Texas! Love being able to go outside without a coat, hat and gloves for the first time in 6 months! I love the smell of fresh grass, the warm breezes, and the sunshine! Everything coming back to life, especially the flowers! What a great comp! Favourite thing about Spring - less layering for the kids! I love the longer days and the sounds of birds singing - bring on Spring! I love the daffodils and primroses here in the U K .
Your quiet books are genius. I cant wait for my little guy to try these out! I love the warmer weather, and VACATIONs! I love the warmth and I love that my kids can get outside and explore nature! I love all these quiet book ideas for older kids! the return of warmth-- no coats! Spring flowers and spring showers. I am wishing for a good thunderstorm this weekend. I would love to have these to make for my active little guy to help during church. Just hope I can make them look as well put together as you do. I love the beautiful flowers in spring! My favorite thing about spring is the beautiful flowers! I love all the freshly bloomed flowers and especially flowering trees. The flowers and my anniversary! I love the longer days and long walks outside! Seeing bulbs peeking up through the ground! My favorite thing about spring is the welcoming of warm weather and beautiful flowers.